Radhakrishna Tumbalam Gooty was awarded the Bilsland Dissertation Fellowship for the 2019-2020 fiscal year. Group members Dr. Zheyu Jiang, Yiru Li, Tony Mathew, Scott McClary, David Rokke and Radhakrishna Tumbalam Gooty gave oral presentations at AIChE Annual Meeting 2018. Congratulations to Dr. Jiang for successfully defending his PhD Thesis titled “Multicomponent Distillation – Mathematical Modeling, Global Optimization, and Process Intensification”. 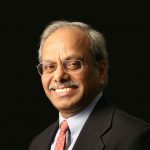 Professor Agrawal’s current interest and passion is in energy production issues especially from renewable sources such as solar. The thrust of research is to fabricate low-cost solar cells based on nanotechnology. Another major thrust of his current research is the development and optimization of processes to meet essential human needs including transportation fuel, chemicals, and electricity, primarily from renewable energy sources to enable a sustainable economy. This effort is also focused on efficient conversion of biomass to liquid fuel and maximizing liquid fuel from a given quantity of biomass. The group is also involved with developing efficient separation processes. Currently methods to synthesize and identify energy efficient distillation configurations for multicomponent separation are being developed. Additional effort is being devoted to develop optimal methods for membrane separation processes. He has a broad experience in hydrogen production and purification technologies. This has evolved from his earlier activity in developing integration steps within coal gasification combined cycles for power as well as syngas generation. His research interests also include basic and applied research in process development, gas liquefaction processes, cryogenics, and thermodynamics. “Synthesis and Characterization of 15% Efficient CIGSSe Solar Cells From Nanoparticle Inks,” S. M. McLeod, C. J. Hages, N. J. Carter, and R. Agrawal, Accepted for Publication in Prog. Photovolt. : Res. Appl. “A Synergistic Biorefinery Based on Catalytic Conversion of Lignin Prior to Cellulose Starting from Lignocellulosic Biomass,” T. Parsell, S. Yohe, J. Degenstein, T. Jarrell, I. Klein, E. Gencer, B. Hewetson, M. Hurt, J. Im Kim, H. Choudhari, B. Saha, R. Meilan, N. Mosier, F. Ribeiro, W. N. Delgass, C. Chapple, H. I. Kentt?maa, R. Agrawal and M. M. Abu-Omar, Green Chemistry, Available online DOI: 10.1039/c4gc01911c. “Thermal Coupling Links to Liquid-Only Transfer Streams: A Path for New Dividing Wall Columns,” G. Madenoor Ramapriya, M. Tawarmalani and R. Agrawal, AIChEJ, 60, 2949 (2014); DOI 10.1002/aic.14468. From Shale Gas to Renewable Energy Based Transportation Solutions, D. S. Mallapragada, G. Duan and R. Agrawal, Energy Policy 67, 499 (2014). 9% Efficient Cu2ZnSn(S,Se)4 Solar Cells from Selenized Nanoparticle Inks, C. K. Miskin, W.-C. Yang, C. J. Hages, N. J. Carter, C. S. Joglekar, E. A. Stach, and R. Agrawal, Progress in Photovoltaics: Research and Applications, DOI: 10.1002/pip.2472. Continuous power supply from a baseload renewable power plantâ€, E. I. Al-Musleh, D. S. Mallapragada, and R. Agrawal, Applied Energy, 122, 83, (2014). Limiting and Achievable Efficiencies for Solar Thermal Hydrogen Production, D. S. Mallapragada and R. Agrawal, International Journal of Hydrogen Energy, 39, 62 (2014).